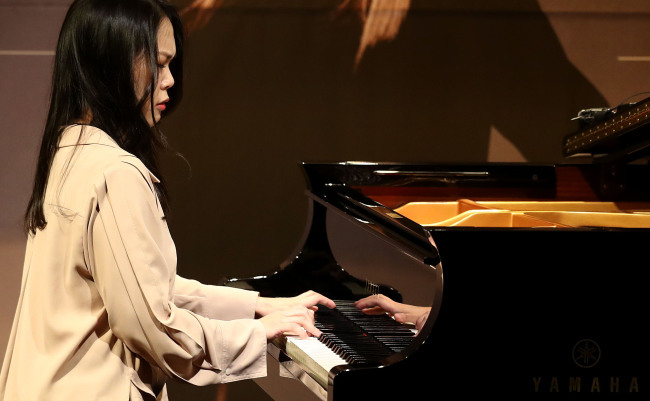 Pianist and artistic director of Great Mountains Music Festival, Son Yeol-eum is dedicating her latest album to her late mentor Sir Neville Marriner. Simply titled “Mozart,” the album due to be released Friday, includes a recording of Mozart Piano Concerto No. 21 in C Major, K.467 by the young pianist and the venerated conductor. It is the first and the last recording the two have done together. Pianist Son and Marriner first met in April 2016, when she performed with Marriner and the Academy of St. Martin in the Fields in Korea. “After the performance, Marriner strongly suggested I should start recording Mozart‘s concertos if I really love Mozart. He added that if you start at the age of 30, you will be able to finish all the concertos by around 50. So, I asked him who should I record with, and he asked to do it with him. I was so pleased and had to ask him a couple of times to make sure,“ said Son at a press conference held on Monday to promote her new album. Her first recording with Marriner came just two months later, starting with Mozart Piano Concerto No. 21 in C Major, K.467 -- the piece pianist Son performed at the International Tchaikovsky Competition in 2011. ”The recording process with Marriner was the easiest one I have ever had. It was recorded over a one-day period, but all I had to do was follow his directing,“ Son said. “He was very open to my taking the lead throughout the recording process,” she added. The album production, however, came to a halt as Marriner passed away in October 2016, just six months after their first meeting. In commemoration of her late mentor, Son decided to push ahead with the release of the album, featuring the recording with Marriner and three other works. Other works in the album are Mozart‘s Variation in C Major on “Lison Dormait,” K. 264 and Piano Sonata No. 10 in C Major, K330 and Fantasy in C Minor, K475. “This Mozart’s Fantasy is my last gift to dear Marriner,” said Son before performing the piece at the press event. Mozart’s music has multiplicity, Son commented, while discussing her own thoughts regarding Mozart. “Mozart‘s music is always twofold, multiple-sided and ironic for that matter. It contains various musical expressions at once and that is why I like his music very much. Regardless of their length, Mozart’s pieces have the quality of an opera. His music provides the feeling of a drama unfolding like in an opera,” said Son. On April 20, pianist Son is scheduled to perform at Cadogan Hall in London, accompanied by the Academy of St. Martin in the Fields led by Tomo Keller. In October, Son and the Orchestral Ensemble Seoul will tour Korea with “Amadeus” to mark the second anniversary of Marriner‘s death.